The grass pictured on the right is perennial Rye. This photo was taken in February and the grass was planted in the middle of October. One can have green grass all year long in Phoenix, even though the winter and summer climates are very different. The way this is done is by growing Bermuda grass in summer and Rye grass in winter. Although grass consumes relatively large amounts of water, an accurate understanding of how much water the grass really needs can minimize waste. Bermuda is grown in the Phoenix area in summer. It can take the desert's hottest weather as long as it has sufficient water. During winter it is dormant, meaning that it is yellow and appears dead. However, below the surface it is alive and waiting for warmer weather. Bermuda usually starts to slow down and go dormant in September and starts growing again in May. This life cycle makes it so Bermuda does not have to be replanted each year. Therefore, if a winter lawn is desired, it can be planted over the dormant Bermuda. When high afternoon temperatures start to kill the winter lawn, in May, the Bermuda grass takes over again. Bermuda grasses ability to spread out can be both a blessing and a curse. On one hand it will quickly fill in any damaged areas in the lawn, but on the other hand it can move into flower beds and other parts of the yard where it is not desired. The best defense against this behavior is to border the lawn with a solid concrete/concrete brick border and to have a dirt or rock buffer zone outside the border that is not watered. Deciding to plant Bermuda will involve making the decision of which variety to plant. Bermuda is divided to into two main categories, common and hybrids. Common Bermuda grass is planted using seed while most hybrid varieties are propagated using sod or sprigs. Planting seed is less costly than putting in sod but hybrids do have some notable advantages, the most important of which are that they do not produce pollen, and can have a more desirable texture. Hybrids can generally be categorized into two classes, medium density and high density. EZ Turf Midron is the best known medium density, while some high density varieties include Tifway, Tifway II, TifSport, Bob-Sod, and Santa Ana. High density hybrids tend to look a little nicer than common Bermuda and medium density hybrids because they are denser and finer. However, there is a price to be paid for this difference because high density hybrids have to be kept shorter. A less dense grass can be mowed at 2 inches and will still look good, while high density grass will have brown patches if allowed to grow this tall. The brown patches are caused by the fact that the grass is so thick that the leaves are only at the ends of the stalks, forming a sort of canopy. If allowed to grow taller than recommended all the leaves get scalped off during lawn mowing, leaving nothing but the brown stalks. Less dense grass has leafs that are spread out over its height and can therefore be mowed at a variety of heights. Grass that has to be kept under 1.5 inches high cannot be cut with a regular rotary mower. A reel mower will need to be used instead. Keeping the grass this short requires more frequent mowing and also exposes the soil to more sun and heat, requiring more frequent watering. Lower density grass overseeds better than high density because it has more open spaces which allow the winter grass seed to penetrate. For most homeowners, who are not trying to build a golf course, a medium density hybrid or common Bermuda are the best choice. As detailed above, they use fewer resources, are less labor intensive, and overseed well. The best time to plant Bermuda in the Phoenix area is in the middle of April. First, use a powered tiller to turn up the soil to a depth of at least 3 inches. Work in some compost during tilling and pay attention to the lawn contour. Ideally, the lawn should be a little bit higher in the center than on the borders to prevent puddling during watering. Carefully plan the sprinkler layout. It is much harder to go back and move PVC pipes and sprinkler heads than it is to get it right the first time. Install the irrigation system and install any lawn borders, such as brick edges. If planting common Bermuda, sow the grass seed using a drop spreader. Cover the seed with a thin layer of manure compost mix. This will keep birds off and help the seeds to stay moist. The mix can be spread using a fertilizer spreader, or by simply cutting open the bags and dragging them in a line while letting the mix steadily come out. The lines of mix can then be spread using a garden rake. Water the seed for ten minutes at a time, twice a day for the first three days. After this slowly taper off. The ground should be kept moist but not soaking wet. Typically, the grass will emerge within two weeks. If planting hybrid Bermuda, prepare the soil the same way as is detailed above for planting seed. Sod should be placed on top of the prepared soil and watered similarly to a seeded lawn. Sod can be expensive, and Bermuda grass is very good a spreading out. Therefore, money can be saved by purchasing less sod than is required to plant the entire lawn and breaking the sod pieces into smaller sprigs which can be evenly spaced over a larger area. Since Bermuda grass only needs to be planted once, subsequent summers will involve the Bermuda coming out of dormancy. The Bermuda will come in more fully and rapidly if the death of the Ryegrass is accelerated by letting it dry out in early May. Two weeks without watering is usually sufficient to kill the ryegrass. After the Ryegrass has turned brown, resume watering to encourage the Bermuda out of dormancy. Rye is grown in the Phoenix area in winter. Since Rye does not survive the summer, it needs to be replanted every fall, in the middle of October. Rye grass stays a lustrous dark green until the middle of May, when it quickly dies off as temperatures approach 100 degrees Fahrenheit. Ryegrass comes in two types, perennial and annual. In the lower desert, both types are more or less annual because the summer heat kills them. Perennial is more expensive than annual, but the extra cost is generally worth it, considering the effort involved in overseeding. Perennial germinates faster, has a finer leaf texture, a darker green color, and is more vigorous than annual. Also, perennial Ryegrass doesn't produce grass stains like annual does. The best time to overseed Bermuda with Rye, in the Phoenix area, is from early to middle October. Plant too early and the sun can bake the seedlings. Also, when the weather is still hot the Bermuda is still growing and will compete with the Rye seedlings. Plant too late and germination is slow because the weather isn't warm enough. So, there is a relatively small window of opportunity. To prepare the Bermuda grass for overseeding scalp it as short as possible without actually digging it up or sucking up a bunch of dirt with the mower. Also, if the mower is lugging really hard you're probably going too far down. Cutting to around a half of an inch in height is usually about right. Watch out for those sprinkler heads when you are cutting this low to make sure you go around them. After scalping the Bermuda should be thatched. For smaller lawns a thatching rake is sufficient. Next, sow the grass seed using a drop spreader. A thin layer of manure compost mix can be used as a cover, but this is often not necessary. The manure compost cover aids in germination and amends the soil, but just spreading some extra seed will make up for any germination differences. However, using a cover is important if one is starting a new lawn, because in this case the soil present is native desert soil and there is really not sufficient topsoil for the grass. The manure compost mix can be spread using a fertilizer spreader, or by simply cutting open the bags and dragging them in a line while letting the mix steadily come out. The lines of mix can then be spread using a garden rake. If you decide to cover the seed, it is the most labor intensive part of the job, and the most expensive because a lot of mix is needed. Local stores will often recommend using a cover every year because it is good business for them. Water the seed for ten minutes at a time, twice a day for the first three days. After this slowly taper off. The ground should be kept moist but not soaking wet. Typically, the grass will emerge within two weeks. Manure compost mix comes in primarily two grades, regular and deodorized. The deodorized mix costs about three times what the regular mix costs. The regular mix doesn't smell as bad as straight manure because it is mixed with compost, so the smell isn't a huge problem. However, the regular typically has lots of foreign objects in it from the stockyard, such as bones, rocks, and pieces of wood. This makes the regular a bad choice if you are going to use a manure spreader. The deodorized is clean of objects and of uniform consistency. So, the best choice really depends on your budget and how you are going to spread the cover. These characteristics are only presented as general guidelines and can of course vary by supplier. Bermuda and Rye do well on a grass watering schedule. Grass is generally watered using sprinklers but can be watered using flood irrigation as well. Flood appears to be an option only for Bermuda because it involves infrequent deep watering. Ryegrass is not as drought resistant as Bermuda and therefore does not appear to be as well suited to flood irrigation. Given the Phoenix areas limited water supplies there is a lot of concern about conserving water. Listed here are some ways to use water efficiently. Have a relatively small lawn. Limit the lawn to a well designed bordered area instead of wrapping it around the house as is done in rainy climates. Have a lawn only in the backyard were it will be used by kids or enjoyed during a barbeque. Water in early morning, finishing at least an hour before the sun comes up, to minimize loss to evaporation. Do not overwater. Watering the lawn every day not only wastes water but makes the grass less healthy. Strive to train the grass to use as little water as possible. Watering the grass more deeply and less frequently will encourage it to grow deeper roots. Set the lawnmower to a high cutting level. Taller grass shields its base from evaporation and therefore requires less watering. Two inches is a good cutting height. Note: Hybrid Bermudas should not be allowed to grow above their recommended cutting height. See above for more information on hybrids. Do not water after rain. In fact, in rainier winters, Ryegrass can go months without needing to be watered. Only have one season of grass. If having summer grass is not that important to you, then only have winter grass. Watering frequency is much lower during the winter and the winter grass lasts 7 months vs. the 5 months that Bermuda grows. 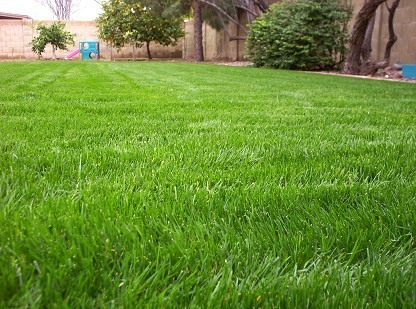 Grass doesn't need near as much fertilizer as is recommended on the back of a bag of fertilizer. Fertilizing 2 to 4 times a year is usually sufficient. The big bonus that goes along with fertilizing less is that one doesn't have to mow as much. Rye grass does not have any significant pests in the Phoenix area. Bermuda is bothered most by the white C-shaped grubs that are a type of beetle larva. These larva will cause parts of the lawn to die back certain times of the year but Bermuda will always fill back in, because it is so vigorous. There are commercial products especially dedicated to killing grubs. Whether killing the grubs is worth the trouble depends on how much they are affecting the lawn and the expectations of the homeowner. Bermuda grass is unusually resilient and hard to remove. Cutting off the water to Bermuda, even in the extreme lower desert, will not completely kill it. Without water, it will thin out and become more clumpy but still persist. The best way to get rid of it is to dig it out. To get its roots one has to go at least six inches deep. Small areas can be dug up with a shovel. Larger areas will most likely require some kind of mechanical means. Once dug up, some little sprigs will always survive. The best way to get rid of these last remaining clumps is to spray them with an herbicide when they appear. St. Augustine, Buffalo Grass, and Centipede Grass appear to be viable alternatives. Nut Grass, considered an obnoxious weed in most parts of the country, actually makes a decent summer lawn here in Arizona. It can often be found mixed in with Bermuda, but only pushes out the Bermuda when insufficient water and fertilizer slows the Bermuda down. Nut Grass grows in full sun and requires less water and fertilizer than Bermuda. It has a fairly large blade, smaller than St. Augustine though, and grows in small sprigs with the leaves emerging from the base. When first emerging in the spring, new grass blades have pointed heads that are painful to walk on barefoot, but this characteristic goes away later in the season. It reproduces through seed and does not have runners. I'd like to thank Joe and Kay Brotherton from East Texas for identifying the Nut Grass in my yard, which was previously a mystery plant to me.